I had a wonderful pregnancy with little to no complications. Savannah arrived into the world 2 weeks late and after a long and hard labour, our not so little girl arrived. I've been one of the luckiest mums around with a daughter who taught me how to breastfeed from the minute she was born. 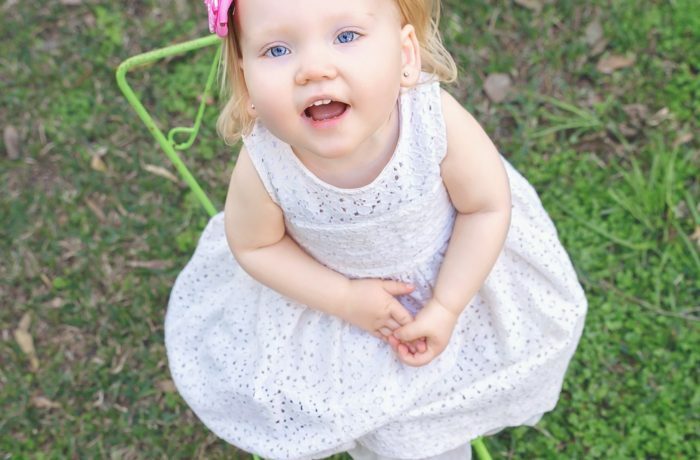 Around 6 weeks of age our GP thought that as a combination of Savannah's little weight gain (failure to thrive as they call it), failed hearing tests, low reflex response, and minimal facial features, she should be checked by a medical paediatrician. After a hard time going through a run of Paediatricians, we finally found an amazing Doctor who was caring and supportive. She did a full chromosomal test and Savannah was diagnosed with SMS at Christmas 2013. This was a massive shock and took us a long time to accept and be content with our new situation and future. Our journey through this rare condition has changed our lives forever. In the last two years my husband and I have changed the way we live, to ‘help’ Savannah thrive to her fullest potential and still to this day are trying to look for different ways/therapies to help. The hardest thing with this condition is that it is so rare. Doctors and professionals have not heard of SMS little lone know how to treat it. Savannah is now 2 ½ years old with a little sister Delta and doing better than we ever expected. We will always be proud of Savannah no matter where life takes us, it’s not the destination but the journey that matters.